Maurice Lacroix has repeatedly shown ingenuity, offering reliable timepieces which deliver alternative means of depicting time. The progressive watch brand launched the Masterpiece Square wheel combining clover-shaped and square wheels to indicate seconds. The eye-catching Masterpiece Mysterious Seconds broke convention employing a baton-like hand to impart time in an unusual linear form. 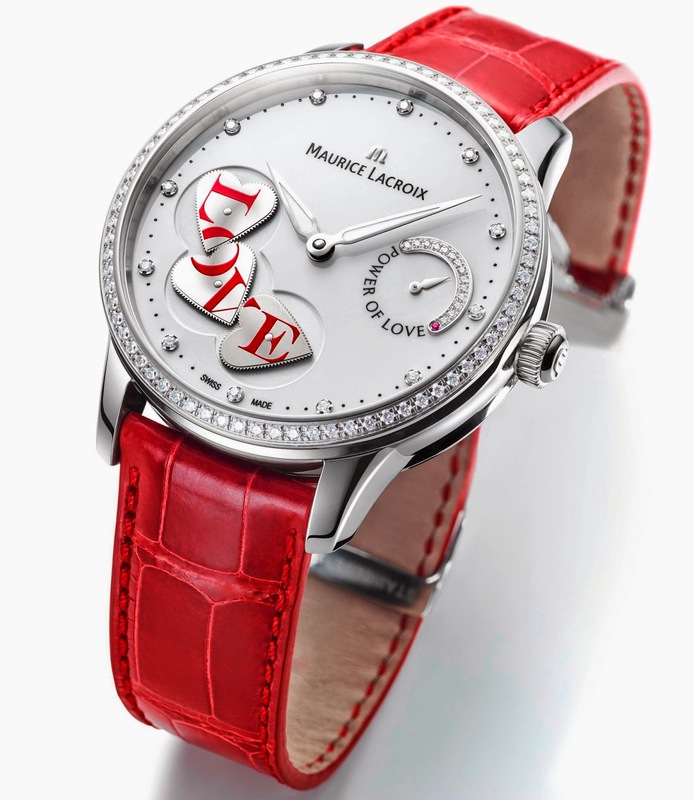 Once again, Maurice Lacroix has produced a unique watch, the Masterpiece Power of Love featuring a new complication which reinforces its premium offering within its women’s collection. The Masterpiece Power of Love cheerfully combines three hearts on its dial which romantically embrace and rotate in an enchanting motion. In contrast, the timepiece contains serious Swiss watchmaking know-how by incorporating the 14th Maurice Lacroix Manufacture movement, the automatic Calibre ML256. The Masterpiece Power of Love perfectly illustrates the creativity of this forward-thinking watch company which, similar to love itself, never ceases to surprise and delight. The Masterpiece Power of Love captures the beauty of love with its graceful white lacquered dial and flourishes of sparkling detail.The rhodium plated hour and minute hands impart the time with stylish splendour. Each curving line engages with light, shining brightly and proving simple to read. Each hour is marked with a circular diamond, charming the wearer with a notable degree of glamour. The white lacquered dial is actually the underside of the main plate, in other words the chassis of the watch. Three heart-shaped wheels turn and interface to deliver a powerful message. The tooth of each wheel has been carefully calculated to engage faultlessly with its neighbouring counterpart without any loss in power transmission. Three heart-shaped wheels interact, ultimately spelling the magical word, “love” in bold red text. On one hand, the unique design language is playful, but the know-how needed to bring this model to fruition manifestly shows the high degree of engineering expertise practised by Maurice Lacroix. The wheels are formed using LIGA (a German acronym for Lithographie, Galvanoformung, Abformung), a state-of the art process for the creation of parts where conventional stamping or milling techniques would prove unsuitable. The result of this progressive engineering is a fascinating spectacle of three wheels which capture attention with their hypnotic motion, delivering a dial design unlike any other. 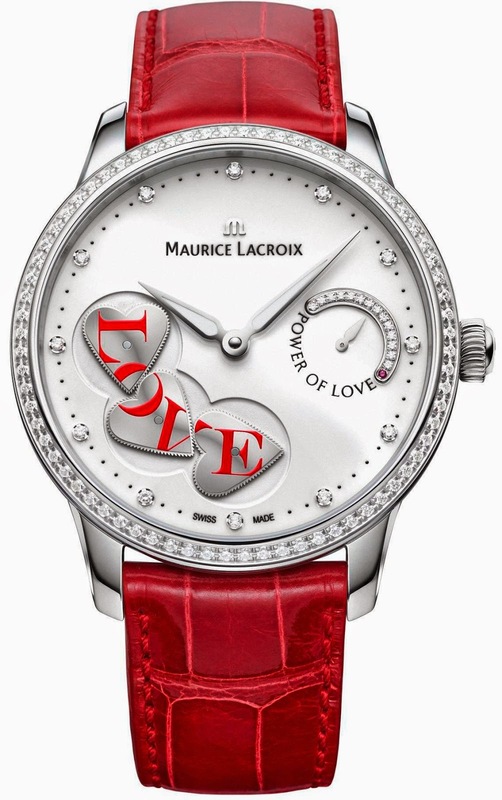 The Masterpiece Power of Love features a power reserve indicator adjacent the crown, revealing the energy held within the spring barrel with an arcing scale employing diamonds. A ruby denotes when the automatic Calibre ML256 is fully wound. 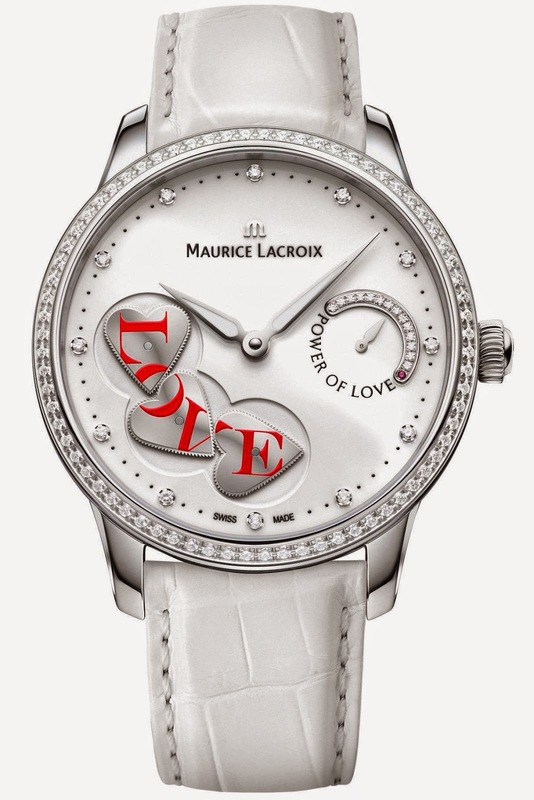 The inscription, “Power of Love” is displayed beneath the power reserve indicator. The Masterpiece Power of Love watch is presented in a polished stainless steel case, measuring 43mm in diameter. It exhibits a confident air, with 72 VS diamonds adorning the bezel. A red genuine crocodile leather strap, presented on a folding clasp, shares the same vibrant colour as the “love” inscription on the dial, contributing to the beauty of this feminine timepiece. The screwed case back features a wide sapphire crystal allowing the wearer to see the heart of the timepiece, the Calibre ML256 with its finely decorated components. The bridges and oscillating mass are rhodium plated and adorned with Grand Colimaçon decoration.